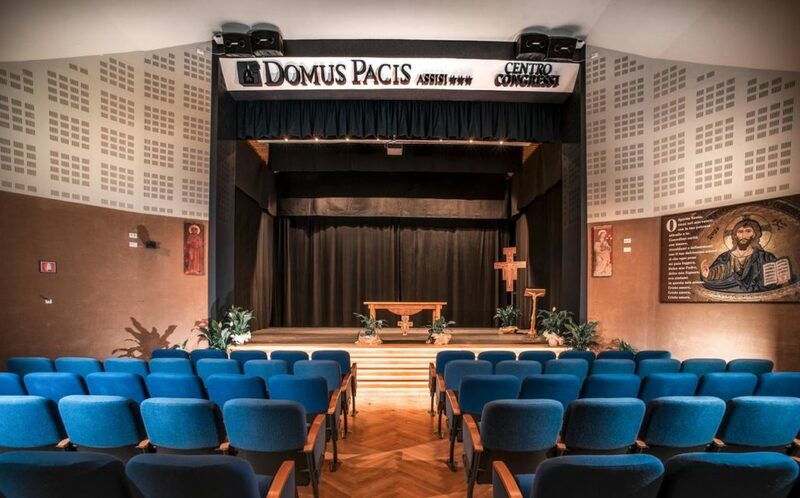 Domus Pacis is a franciscan house of accomodating situated next to the santuary of the Porziuncola and it is near the places Francesco and Chiara’s memory and glory. 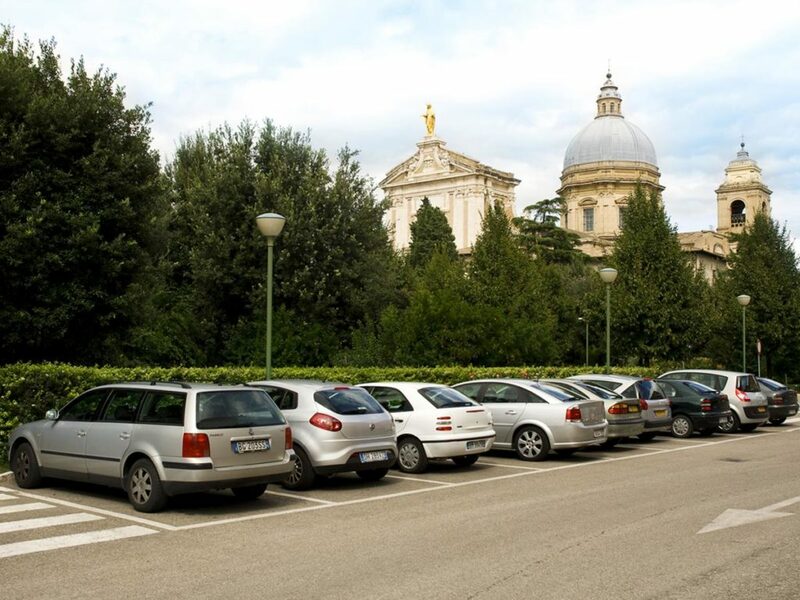 It’s a priviliged place to immerse yourself in the mystic beauty of Assisi, so that you can perceive San Francesco’ Spirit in your soul, always alive in this city that was the scenary of his mirable life. 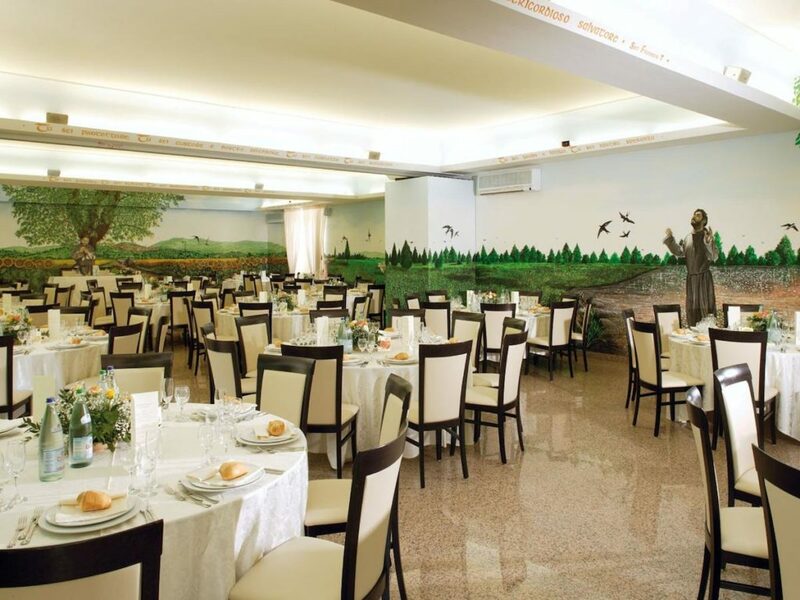 The Hotel has 176 rooms, with two types of rooms Classic and Superior. 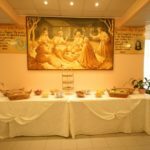 It has been recently renovated and elegantly furnished with a full selection of services that are designed to meet the specific needs of the guests. 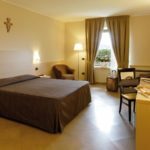 The rooms are comfortable and welcoming, ideal places to return to rest after an intense day enjoying the marvellous sights of Assisi. 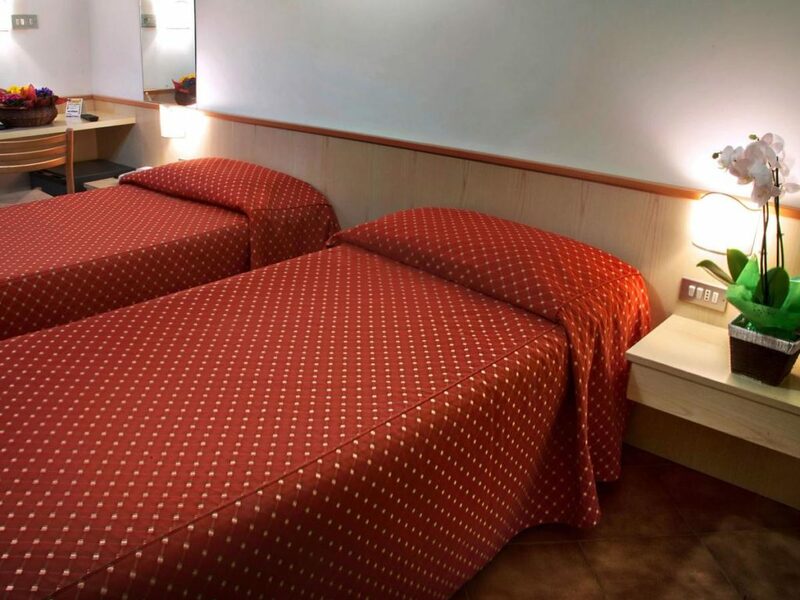 The beds are large and comfortable, with particular regard to cleanliness. 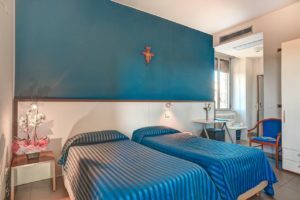 Bed linen, thanks to the care of the staff is always soft and fresh. 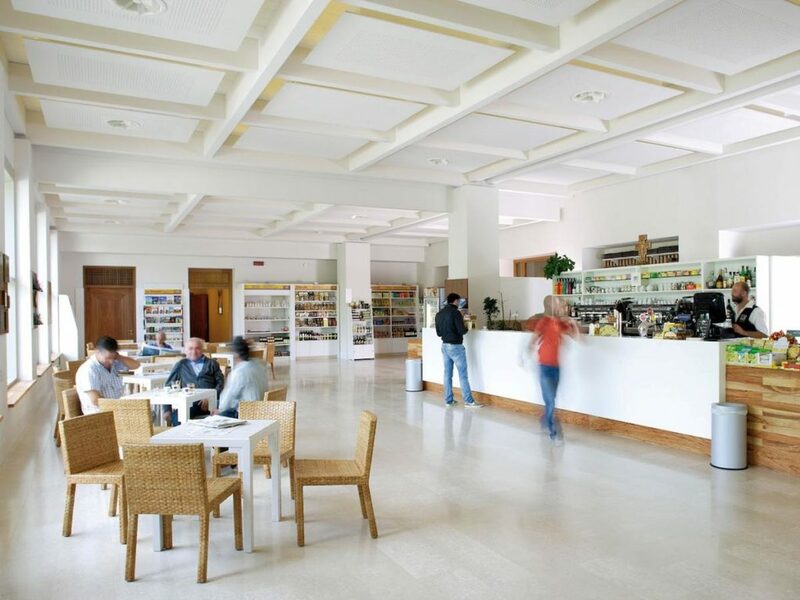 We have given much thought to the bathrooms, the utilities, the cleanness of the air, and their general cleanliness. 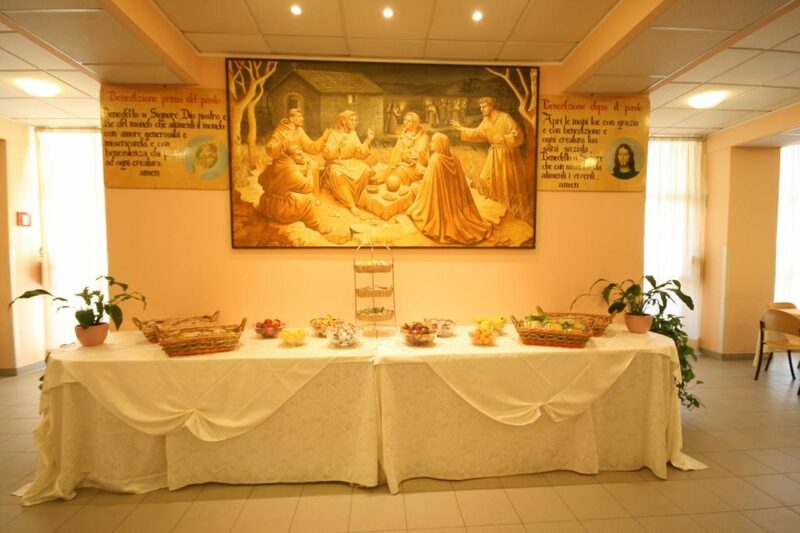 Our primary purpose has been to maintain a high standard of health care. 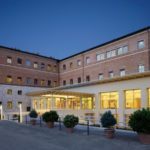 In respect of the lights we have sought to give them a warm tone – everything is aimed at giving satisfaction to our guests which is in line with the “mission” of our hotel. 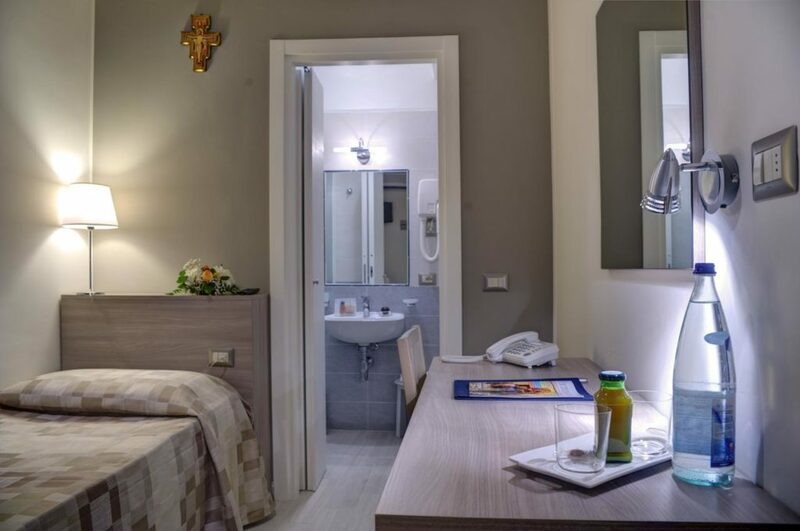 All rooms conform to very high quality standards, for your comfort and well-being. 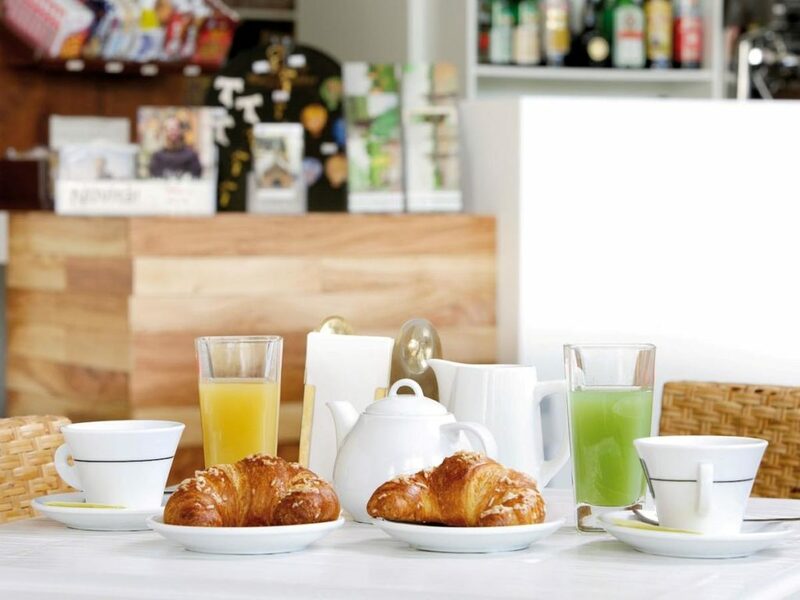 Every room is equipped with what you need to make your stay an entirely pleasant one. 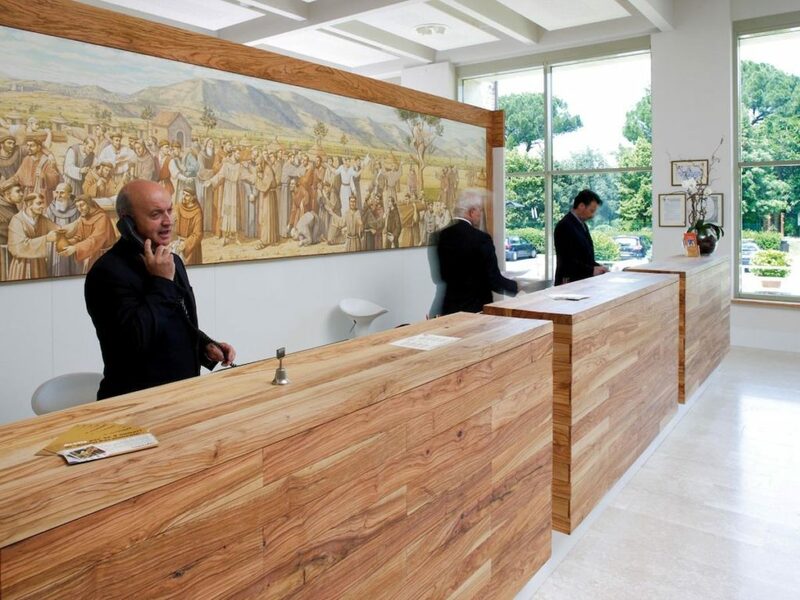 We would respectfully ask you to note that smoking is not allowed in the rooms. 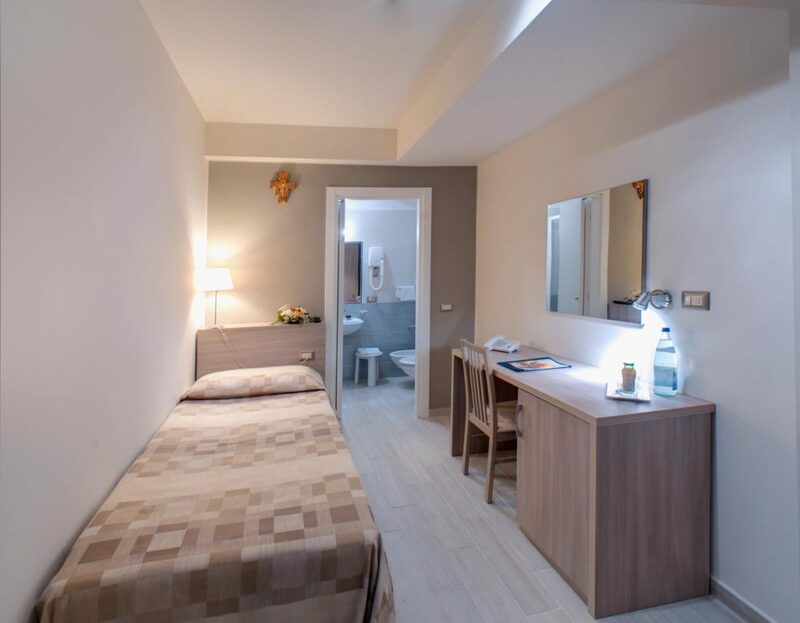 This is the single room which is ideal for those travelling on a restricted budget. 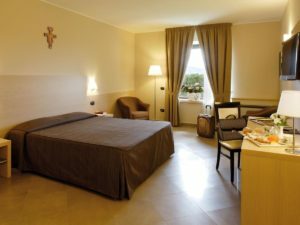 It is welcoming and functional, somewhat smaller than other rooms but still maintaining the comfort that is to be found in all of the hotel. 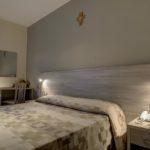 It is en suite with shower, courtesy set, LCD Digital TV, hair dryer, telephone with direct dialling facility, air-conditioning, fridge-bar, writing desk and Wi-fi access to the Internet. 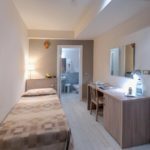 Double room with twin beds to be used as a single room, for those who need more space. 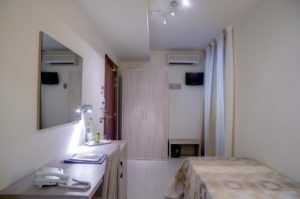 En suite with courtesy set, LCD Digital TV, hair dryer, direct dialing telephone, air-conditioning , fridge bar, writing desk and Wi-fi internet access. 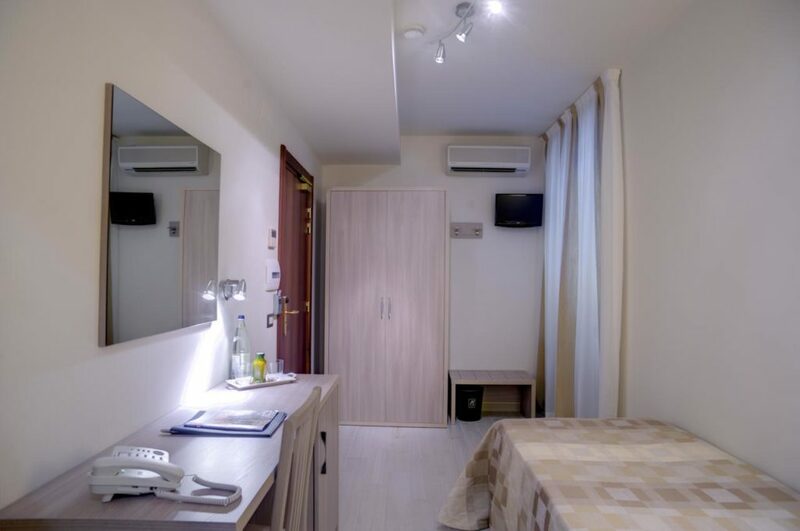 Double room with double bed or twin beds for two adults, relaxing and comfortable, it has all the facilities necessary to make your stay a pleasant one. 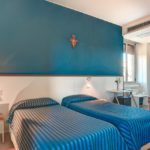 It is en suite with shower, courtesy set, LCD Digital TV, hair dryer, telephone with direct dialling facility, air-conditioning, fridge-bar, writing desk and Wi-fi access to the Internet. 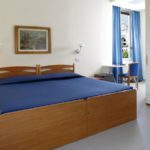 The triple room is furnished with care and has three single beds at your disposition for a comfortable stay. 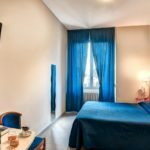 It is en suite with shower, courtesy set, LCD Digital TV, hair dryer, telephone with direct dialling facility, air-conditioning, fridge-bar, writing desk and Wi-fi access to the Internet. 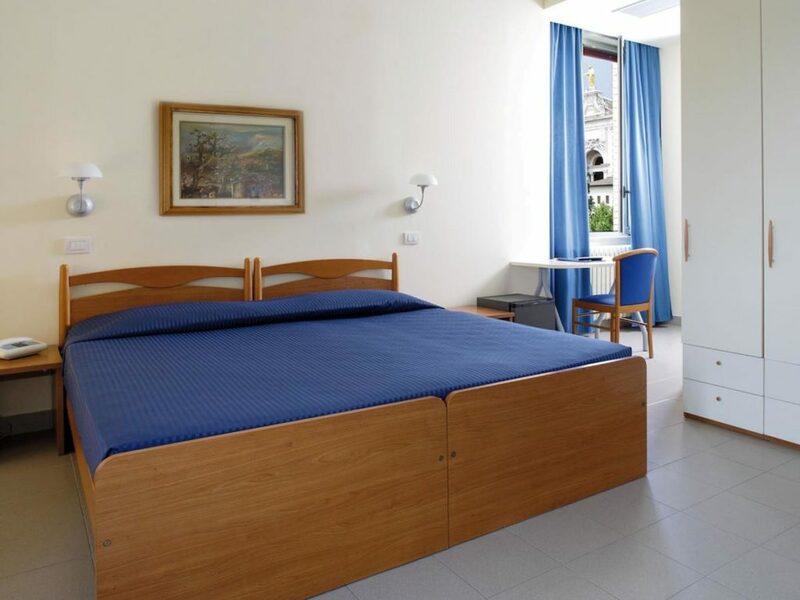 The triple room is furnished with care and has three single beds at your disposition. 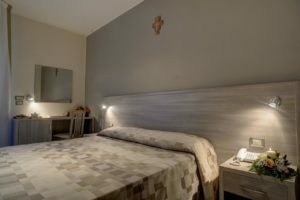 It is possible to add a fourth bed to accommodate a fourth person. 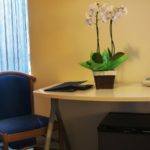 It is en suite with shower, courtesy set, LCD Digital TV, hair dryer, telephone with direct dialling facility, air-conditioning, fridge-bar, writing desk and Wi-fi access to the Internet. The triple room is furnished with care and has three single beds at your disposition for a comfortable stay. 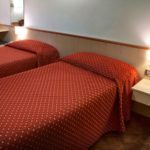 Two beds can be added to accommodate five persons. 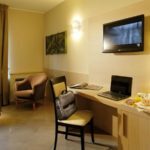 It is en suite with shower, courtesy set, LCD Digital TV, hair dryer, telephone with direct dialling facility, air-conditioning, fridge-bar, writing desk and Wi-fi access to the Internet. Spacious Double room with double bed or twin beds. 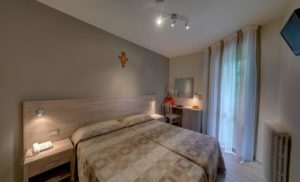 It is well lighted and furnished to provide a comfortable stay. It has two bunk beds added so as to allow accommodation for up to 6 people, ideal for the larger family, or small groups of friends and family, who wish to save on the cost of the stay. 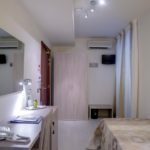 It is en suite with shower, courtesy set, LCD Digital TV, hair dryer, telephone with direct dialling facility, air-conditioning, fridge-bar, writing desk and Wi-fi access to the Internet. Our brand new Superior Double Rooms are light and spacious with twin beds for use by an individual who needs a bit more space. 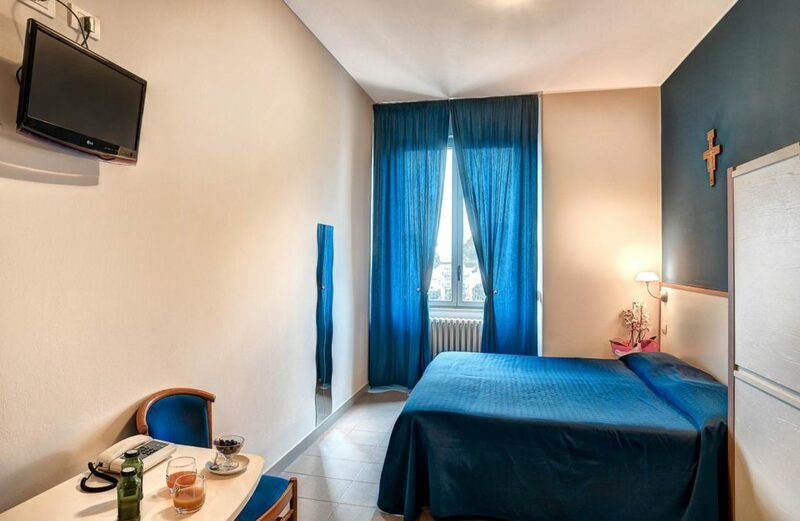 Elegantly furnished with a modern design they ensure that your stay will be comfortable and pleasant, which is further guaranteed by the tranquility and peace that is found in this place. They are excellent en suite rooms with shower, courtesy set, 32” led digital TV, hairdryer, telephone, air conditioning, fridge bar free on arrival with soft drinks and snacks, Wi fi internet access, and safe. 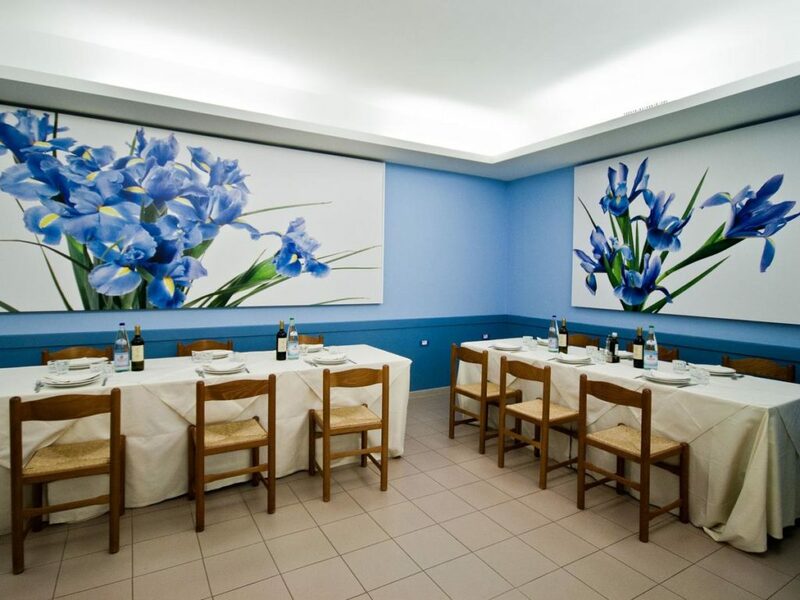 They constitute the best rooms the hotel has to offer, with a pleasant space to lounge. 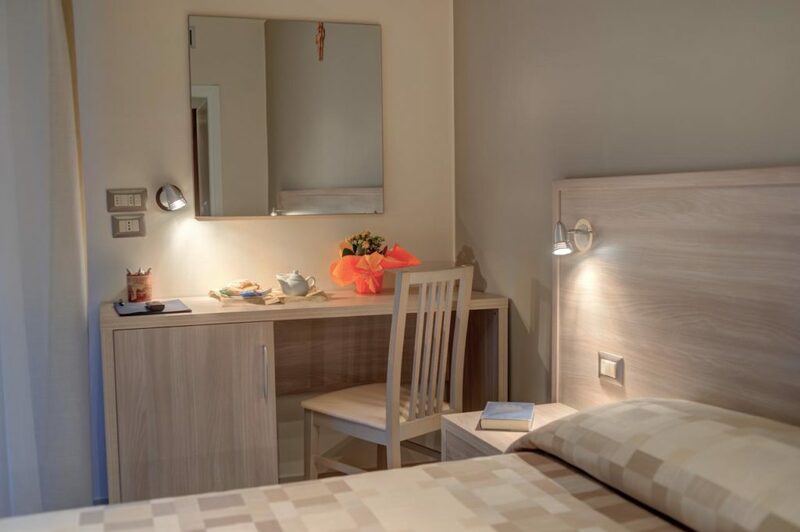 Our brand new Superior Double Rooms are spacious and luminous with twin beds or a double bed. Elegantly furnished with a modern design they ensure that your stay will be comfortable and pleasant, which is further guaranteed by the tranquility and peace that is found in this place. 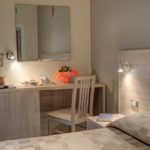 They are excellent en suite rooms with shower, courtesy set, 32” led digital TV, hairdryer, telephone, air conditioning, fridge bar free on arrival with soft drinks and snacks, Wi fi internet access, and safe. They constitute the best rooms the hotel has to offer, with a pleasant space to lounge. 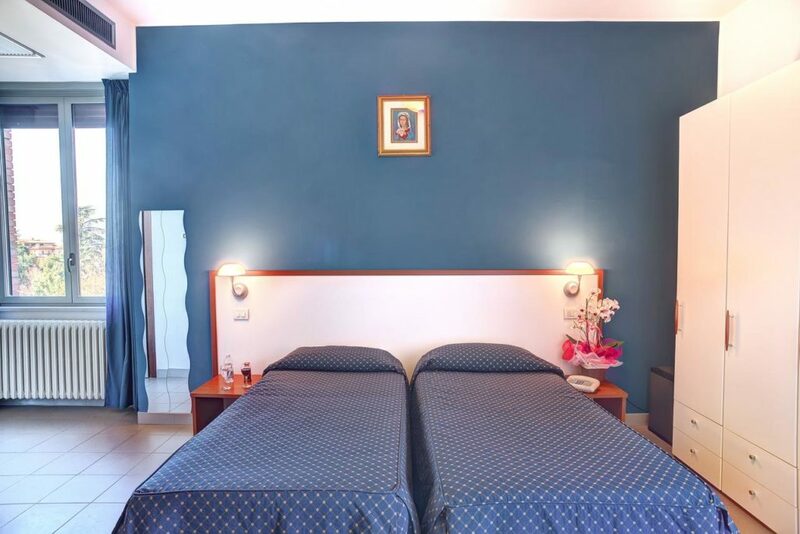 Our brand new Superior Double Rooms are spacious and luminous with twin beds or a double bed, with possibility of one or two additional bed for 3 or 4 people. Elegantly furnished with a modern design they ensure that your stay will be comfortable and pleasant, which is further guaranteed by the tranquility and peace that is found in this place. 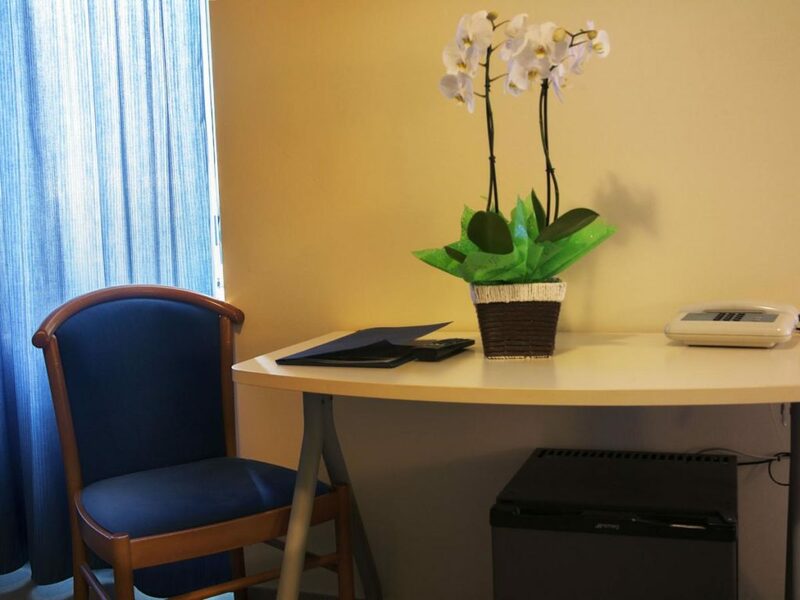 They are excellent en suite rooms with shower, courtesy set, 32” led digital TV, hairdryer, telephone, air conditioning, fridge bar free on arrival with soft drinks and snacks, Wi fi internet access, and safe. 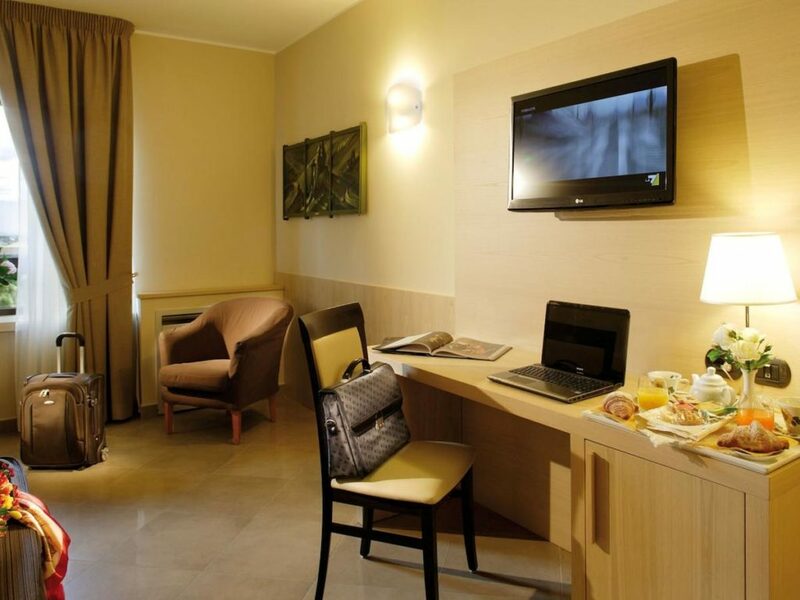 They constitute the best rooms the hotel has to offer, with a pleasant space to lounge. 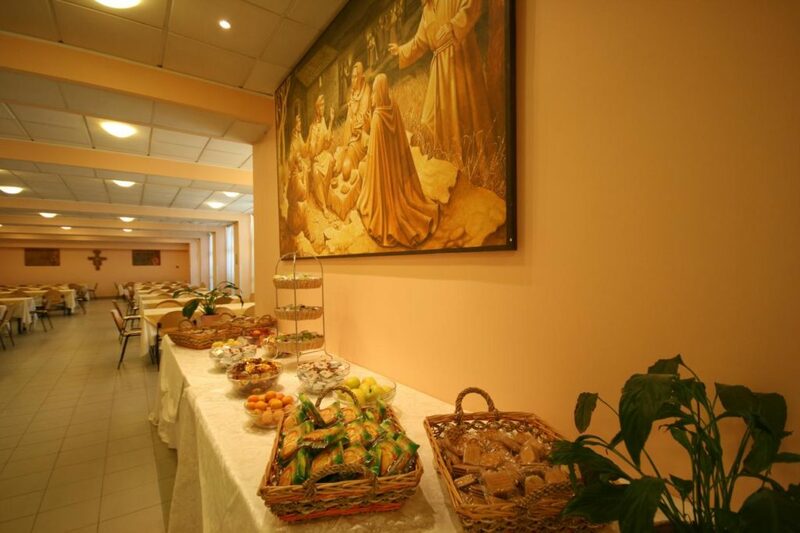 The food is both natural and absolutely delicious. 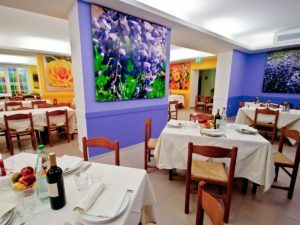 The products used are cultivated locally and as close as possible to the hotel. 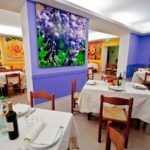 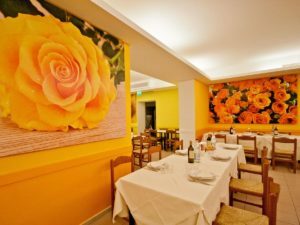 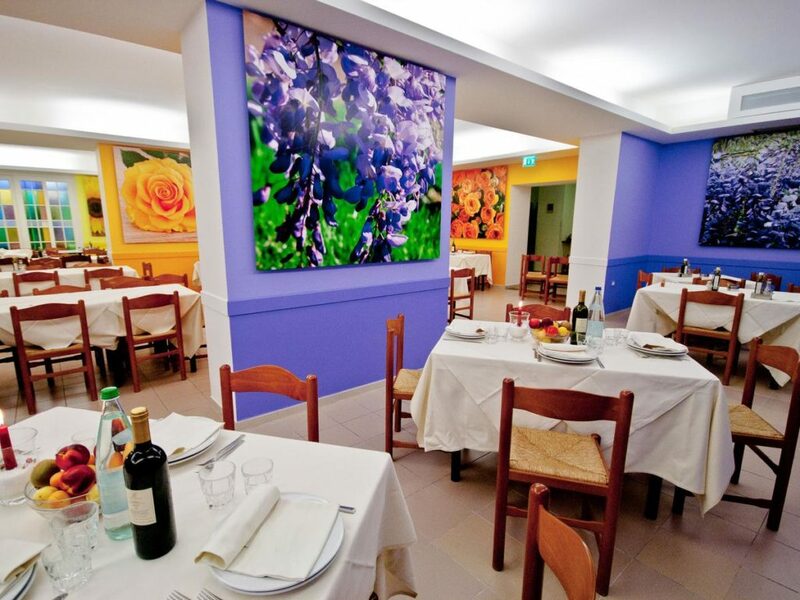 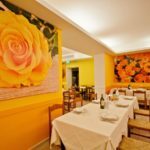 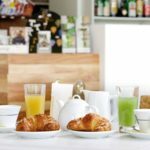 The fresh ingredients and innovative menus which respect tradition are designed to highlight the unique taste of your destination: Assisi. 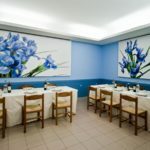 Our wine list, specially chosen to integrate harmoniously with the delicious food, aims to share the passion and talents of the vine growers and wine tasters and to exalt the taste of our cuisine. 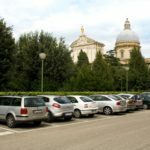 When Assisi is mentioned the seraphic figure of St. Francis immediately springs to mind and the town where he grew up under the shadow of Mount Subasio which due to his memory and renown is now a UNESCO world heritage site. 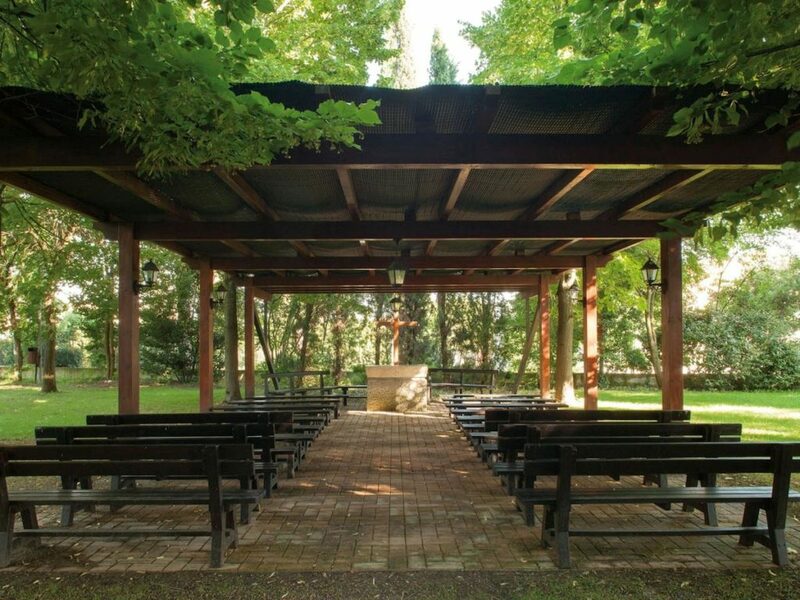 It is a beautiful meeting place, one where you breathe in mysticism, peace and faith, and where history, art and nature can be experienced at first hand. 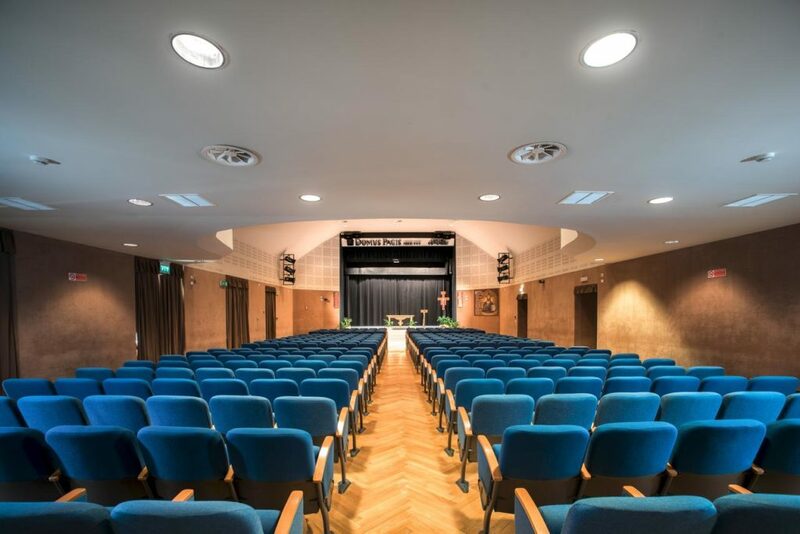 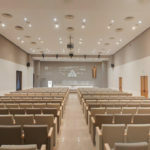 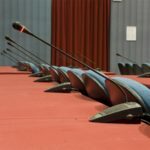 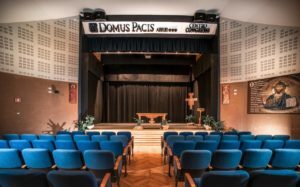 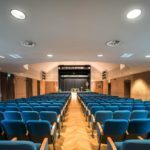 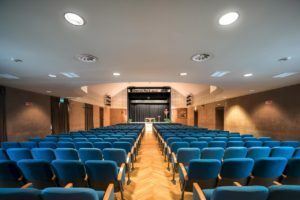 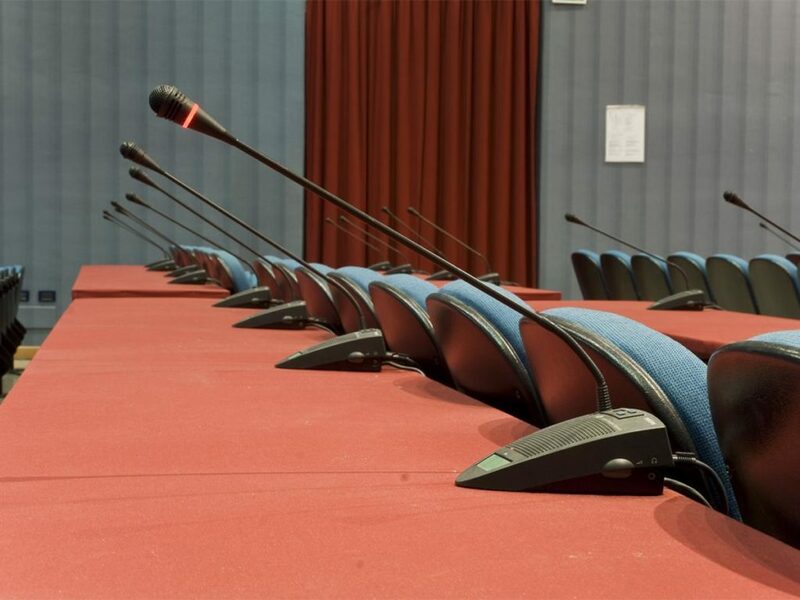 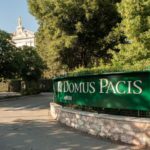 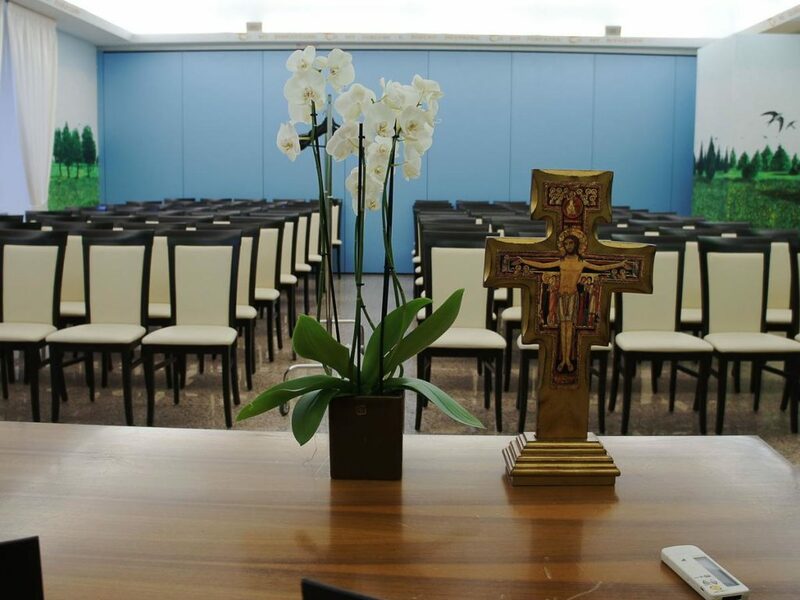 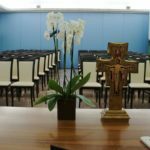 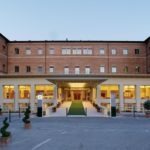 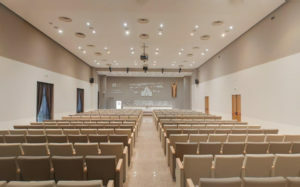 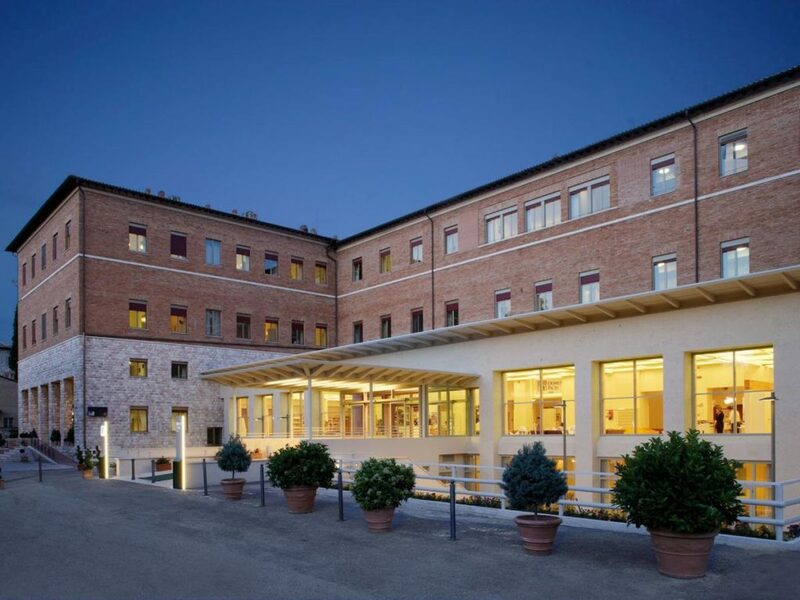 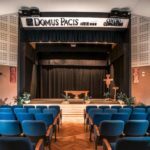 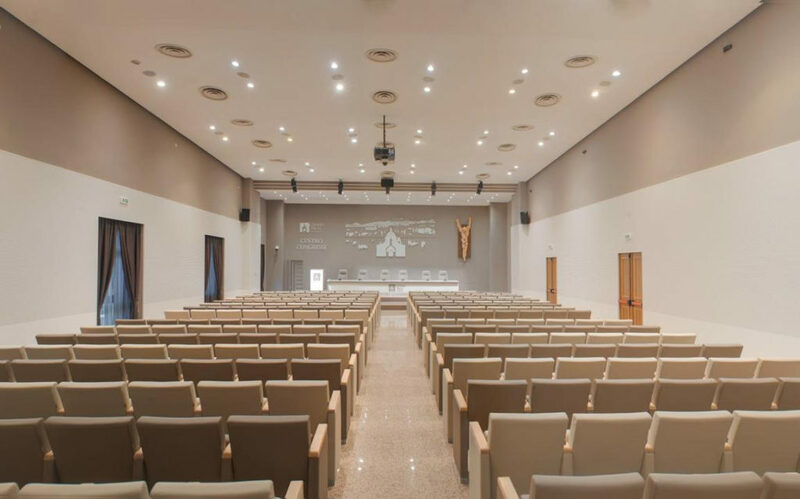 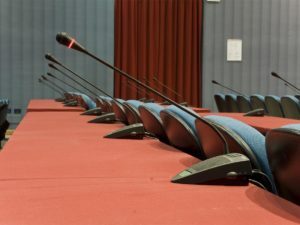 Assisi is ideally located in Italy in the very central region of Umbria and for this reason the Domus Pacis Assisi Conference Centre is logistically perfect for the organization of Conferences, Conventions, Meetings, Training Courses and can cater for large numbers. 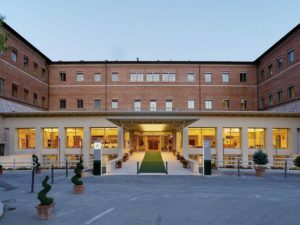 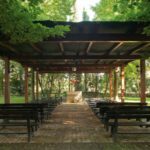 It is easily reachable from all parts of Italy aided by the dual carriageway which covers the whole region, the close proximity of the railway station, and St. Francis of Assisi International Airport of Perugia is only 12km away. The historical centre of Assisi is served by an all day bus service. 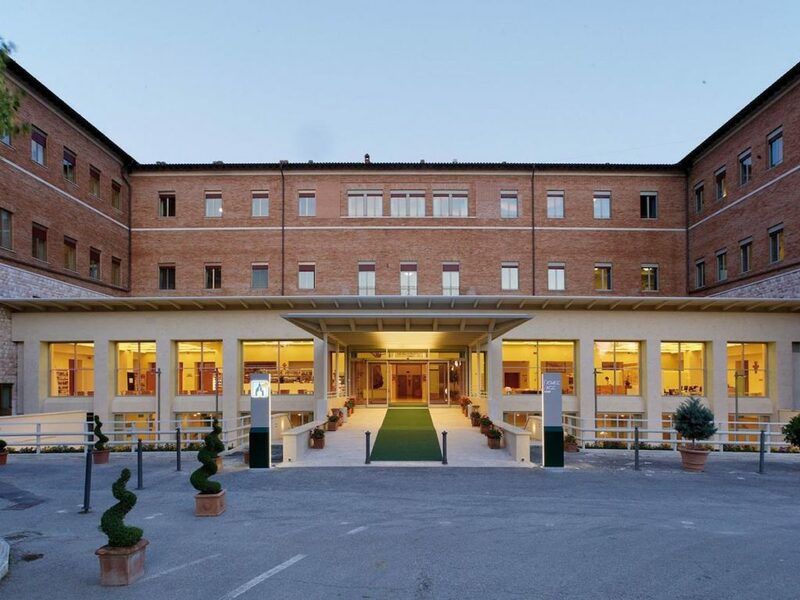 The hotel is located amidst greenery, beside the Basilica of St. Mary of the Angels, and far from the commotion of the town. 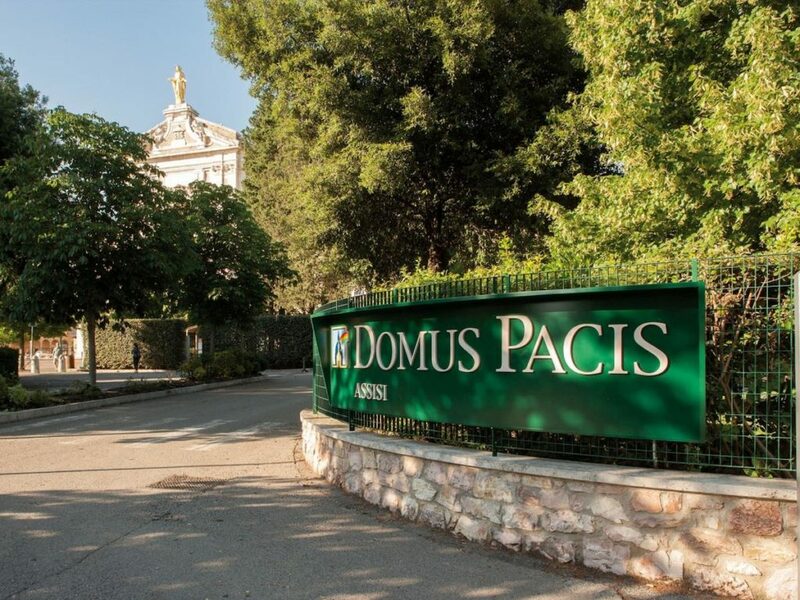 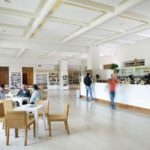 The available open spaces, which allow for concentration on the work in hand make Domus Pacis Hotel Assisi perfect for productive work and team building. 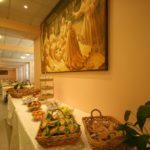 Many of you already know us, but for those who have not yet stayed with us we would like to state that for many years now our establishment has been at the forefront in the region in respect of catering for conferences and conventions. What guarantees a successful outcome to your event are the following attributes: the location; the tranquility of the surroundings with its mature trees; the ample parking facilities for coach and car; the excellent coffee break/working lunch service; the ability of our Chef to design menus for each specific individual event; and most of all the courtesy and professionalism of our staff.